Not to be out of step with the Biennial trend sweeping through the museum world, the long-running DeCordova Annual has been transformed this year into the new DeCordova Biennial providing a more extensive survey of New England’s contemporary art scene, which will be occurring, as the name suggests, every other year. This is probably a good step for the museum, which will allow them to devote more time and resources to putting together a more ambitious show, and if this Biennial is any indication, it’s going to be a well received change. On Sunday Alice and I walked through the museum and were delighted with the depth and breadth of the works selected. 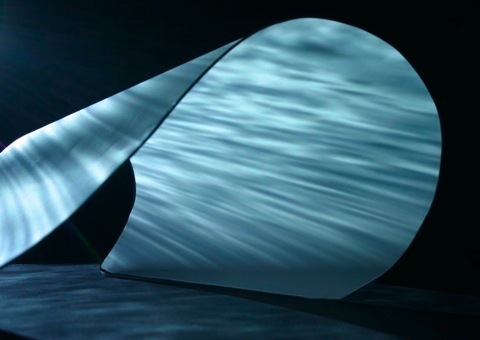 Among my favorite pieces was Georgie Friedman’s “Dark Swell,” a video installation in which you walk through a visual flow of moving water situated in the middle of a dark room. Sound, as well as light comes from multiple perspectives to complete the immersive experience. It was wonderful to stand in the middle of the piece and let my gaze and thoughts wander. You simply have to experience it. Another delight were Ward Shelley’s intricate, hand-drawn timelines which take you through fascinating journeys through calendar time and conceptual space. I simply don’t have time to do justice to all the fine work I saw. Other artists featured in the show are: Greta Bank, Ross Cisneros, Paul Laffoley, Philip Lique, Xander Marro, Christopher Mir, Liz Nofziger, Oscar Palacio, Otto Piene, William Pope.L, Randy Regier, Laurel Sparks, Mark Tribe, August Ventimiglia, and Karin Weiner. The 2010 DeCordova Biennial runs through April 11, 2010 and was organized by Assistant Curator Dina Deitsch, with the assistance of an Advisory Board that included Mark Bessire (Director, Portland Museum of Art); George Fifield (Director, Boston CyberArts Festival); and Jennifer Gross (Curator of Modern and Contemporary Art, Yale University Art Gallery). The value of the collaboration is apparent in the variety and resonance of the works selected, I applaud the curator and advisors for putting on such a wonderful show with a goood balance of established and emerging New England artists. I hope I get a chance to go again before it closes.